RIO DE JANEIRO, BRAZIL – The Economist, a weekly English-language publication is also responsible for organizing a series of conferences that take the ideas from the magazine and discuss them in the flesh. “The Ideas Economy” is a series of events organized by the publication throughout the world with the purpose of providing a forum where talented individuals from different disciplines can share innovative ideas. 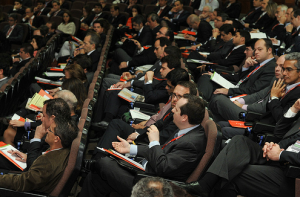 The Economist Brazil Summit in São Paulo in 2010, photo by Economist Group. As the name suggests, the event is focused on how Brazil will foster and improve entrepreneurial-ism and innovation in the coming decades. Paul D. Miller (aka DJ Spooky, That Subliminal Kid), DJ, multimedia artist, author, Antarctic adventurer, is speaking this week’s event after participating in prior Ideas Economy events. He talked to The Rio Times recently about his thoughts on why this type of event is important for Rio now. Miller explained why he was excited to be speaking at the event in Rio. “I’m a big fan of Caetano Veloso, AfroReggae, Nação Zumbi, Bebel, Gilberto et al. I tried to set up a situation where the same eclectic approach to a festival would apply to how people approached the actual conference. It’s a ‘mix tape’,” he said. The result is an eclectic mix of speakers from different areas, including: Brazilian singer Carlinhos Brown; Chief Surui tribal chief Almir Narayamoga Surui; and the Mayor of Rio de Janeiro, Eduardo Paes. Miller is optimistic that this diverse group will drive innovation in the twenty-first century. Brazil, and Rio in particular, is important to the development of the innovative economies. Paul D. Miller (on right) is speaking at The Economist event, photo by Universo Fractal 2010/Flickr Creative Commons License. BRICS has become the buzz word around the world, the acronym, referring to the emerging markets of Brazil, Russia, India, China and South Africa, is included in almost any conversation dealing with global economy. Miller was happy to be involved in the event in Rio. His approach to art and life is reflected in the agenda of the event and creates a situation where ideas from different areas can be shared in an open and supportive forum. “The Economist Festival is just a reflection of the rising tide of what theoreticians like to call ‘cultural capital’; I hope to invigorate the discussion and show a different perspective on the ‘near future’ of the arts. That’s what makes Brazil crucial to what’s going on these days: they live, breathe, and shape the future in Brazil – it’s a collage culture,” he said. The last events by The Economist in Brazil were held in São Paulo, the Brazil Summit 2010: Taking Off: How to Sustain Success and in November 2011 the Brazil in 2022: Ordem e Progresso?. This latest event will be Thursday, May 10, 2012 from 9AM to 7PM at Rua Vice-Governador Rubens Berardo, 100, Gávea. The cost is US$1,795 for individuals and for more information visit the event website.